Executive Director Steven Stegers welcomes participants to the Sharing European Histories project. 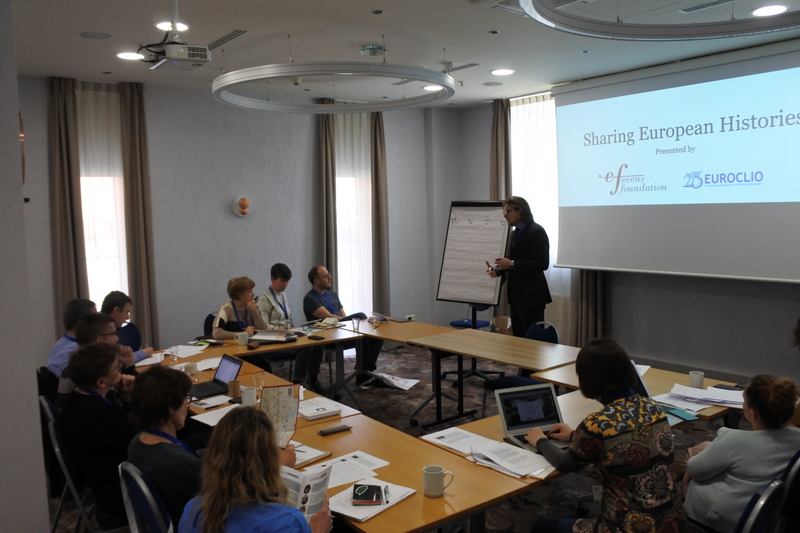 From April 5-7, the Kick-off meeting for the Sharing European Histories Project was held in parallel to the Annual Conference in Gdansk. EUROCLIO partnered with the Evens Foundation on this project because both organizations believe that opening up a space to engage with the dissonant and often conflicting nature of European history is the first step in discovering common positions or overcoming divisions while acknowledging existing differences. On behalf of the Evens Foundation, Chairwoman Monique Canto-Sperber welcomed participants to the conference during the opening cermony, introducing the Sharing European Histories project. The Sharing European Histories Project aims to inspire and support history educators across Europe since we find that history educators are uniquely positioned to engage young people in confronting the dominant national narratives of history to overcome the divisions between nations and cultures.Back in September 2018 EUROCLIO and Evens Foundation put out a call for applicants; from over 70 applications received, two project partner organizations and five individual contributors were selected to join the Sharing European Histories project team. Rounding out the project team are two teacher trainers, Richard Kennett and Iryna Kostyuk, who will work with the individual contributors to help them develop their projects. During the kick-off meeting all the team members had an opportunity to introduce their project ideas. Individual contributor, Helen Snelson, from the UK, shared her proposal for an oral history collection on how people around Europe experienced the end of cold war. Gentian Dedja, from Albania, proposed a practice that explores local historical heroes in cross border contexts to demonstrate how historical figures can surpass national prejudices. Elisabete Pereira, from Portugal, proposed a study of the hidden history of objects that explores the life cycle of their development and circulation around Europe and the globe. Presented in workshop at the Annual Conference, Juan Carlos Ocana, from Spain shared his proposal for actives that help history and citizenship educators confront the complex issues of Jihadist terrorism and the rise of the radical right in Europe in their classroom. In another workshop Joanna Wojdon, from Poland, demonstrated her proposed resource which explores how the historical thinking concept of continuity and change in historical events and processes changes perception depending on different perspectives. Our project partners also shared their proposed projects with conference members during the Marketplace of Ideas. Sonja de Leeuw from EUscreen in partnership with Maja Drabczyk from National Film Archive-Audio Visual Institute, Poland (FINA) and Karolina Dziełak from the European Network Remembrance and Solidarity (ENRS), shared their project proposal to develop interactive learning activates which explore migration in Europe using EUscreen’s large collection of digitized audio-visual sources. From the Croatian History Teacher’s Association (HUNP), Vedran Ristic shared the proposal for a project to investigate local material heritage and the personal stories connected to these materials from a contemporary global perspective. The team decided that the individual contributors will spend the next year working with the teacher trainers to create a set of unified teaching strategies that form the basis of their proposed projects. These strategies will be peer-reviews and published on Historiana so teachers from across the globe can use them to teach history in a way that respects diversity, counters nationalist narratives, and promotes a critical enquiry about the past. Additionally, the individual contributors and project partners will be sharing the outcome of their proposed projects next year at the EUROCLIO Annual Conference 2020 in Serbia. Keep an eye out for further updates on this exciting project!